If you can believe it, I actually found another use for pizza dough: doughnuts. These simple yet classic cinnamon-sugar doughnuts are nothing more than lightly fried pizza dough yet they taste entirely different. It’s also not necessary to deep fry them—an inch or so of vegetable oil in a deep frying pan or pot will do. This recipe was inspired by an episode of Giada De Laurentis’ Food Network show Everyday Italian. Gently roll the dough out into an 8" x 8" square on a lightly floured surface. Use a wine glass to cut as many 3" circles out of the dough as possible. Use a narrow shot glass or large thimble to cut out a smaller hole inside the circle so it looks like a doughnut (save the cut-out holes to make smaller doughnut holes). In a medium bowl mix the sugar and cinnamon until fully incorporated. In a deep frying pan or pot, heat about 1 inch of vegetable oil over medium-high heat. Fry the doughnuts and doughnut holes 2 or 3 at a time for about one minute per side or until lightly golden brown. Using tongs, transfer the doughnuts and doughnut holes 1 at a time into the cinnamon-sugar mixture. 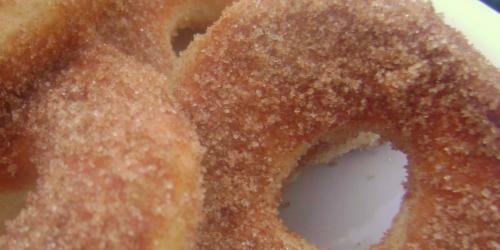 Use your hands to coat well with the cinnamon-sugar and transfer to a plate. Repeat until all doughnuts and doughnut holes have been cooked and coated. I want to reach through the monitor and manhandle those doughnuts. Yum!!! You, my friend, are amaaazing! I don’t know how I never found you before now! Donuts with pizza dough? Genius! You should try making funnel cakes. Super easy and cheap and your friends will be crazy impressed. Maybe funnel cakes with a caramel pumpkin butter sauce?? My youngest wanted doughnuts, but money is a little tight right now so I went looking and found this recipe. I must say I was a little skeptical, but decided to give the idea a go anyway, after all I could make a doughnut hole or two and use the rest of the dough for bread at worst. I made my dough into rounded balls, instead of rolling and cutting, and topped with powdered sugar once they were out of the oil. My picky children, who yuck everything LOVED them!!!! I would have never thought to make it into doughnuts. Now I must say I was out of olive oil so I substituted the same amount of Crisco and could not say how the change affects the taste, but I know I will be making this recipe again! Its statement offers even more details compared to the typical printed declaration on benefit reductions, refined allocations. This is the kind of data I’ve long been attempting to discover. Much thanks to you for composing this data. Its an incredible joy perusing your post.Its brimming with data I am searching for and I want to post a remark that “The substance of your post is magnificent” Great work. Extraordinary overview, I’m certain you’re getting an awesome reaction. Much thanks for composing such a fascinating article on this theme. This has truly made me think and I would like to peruse more. Much obliged to you for such an elegantly composed article. It“s brimming with quick data and engrossing portrayals. Your perspective is the best among numerous. When I originally commented I clicked the Notify me when new comments are added checkbox and after this each time a comment is added I recieve four emails concentrating on the same comment. Possibly there is that is you may get rid of me from that service? Thanks! Published over the ‘employee id’ words. It is your special recognition number. liteblue usps employee login It consists of an excellent remedy and also solution to the customers.